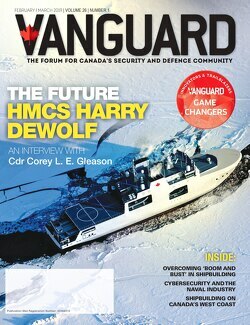 In this episode, Marcello Sukhdeo talks about Defence Minister Harjit Sajjan’s visit to Europe and he also shares an overview of Vanguard’s Game Changers for the February/March issue. Due to its commitment to lasting peace and security, both at home and abroad, Canada is working on all fronts including the international community to ensure the protection of rights and freedoms for all. As part of this effort, Defence Minister Harjit Sajjan visited Europe. The Minister participated in a meeting of the Defence Ministers from the main force contributors to the Global Coalition against Daesh, and in Brussels, at the NATO Defence Ministerial Meeting. In Rome, the Minister highlighted Canada’s ongoing commitment to the Global Coalition against Daesh, and to working with allies and partners to set the conditions for long-term security and stability in the Middle East region. While in Brussels, he participated in the NATO Defence Ministerial Meeting, alongside other NATO Allies and partners. Minister Sajjan highlighted Canada’s commitment to NATO and working with NATO Allies to actively maintain and strengthen the transatlantic bond.